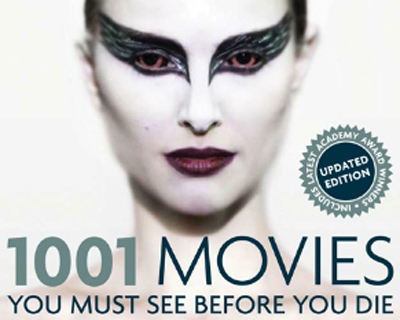 The 2011 edition of 1001 Movies You Must See Before You Die, edited by Steven Jay Schneider, has been released. As in previous editions (2005, 2006, 2007, 2008, 2009, 2010), changes to the list have been limited to 1% of titles, all from the late 1990s onwards. A dozen films have been removed, including Quentin Tarantino's Kill Bill I (first deleted in 2006, then added again in 2008), Gaspar Noe's Irreversible, Baz Luhrmann's Moulin Rouge!, Wong Kar-Wai's Happy Together, and Hayao Miyazaki's Princess Mononoke. The twelve replacement titles include True Grit, The Passion Of The Christ (added in 2005, then deleted in 2009), Inception, and Black Swan.